This dog carries two copies of Em which results in a melanistic mask on the muzzle of the dog. However, a melanistic mask may be unrecognizable on a dog with a dark coat color. This dog will pass on Em to 100% of its offspring and will produce only puppies with a melanistic mask. This dog carries one copy of Em and one copy of N which results in a melanistic mask on the muzzle of the dog. However, a melanistic mask may be unrecognizable on a dog with a dark coat color. This dog will pass on Em to 50% of its offspring who will have melanistic masks and N to 50% of its offspring who will have no masks. This dog carries two copies of N which does not result in a melanistic mask on the muzzle of the dog. This dog will pass on N to 100% of its offspring. The Em variant of the MC1R gene at the extension (E/e) Locus results in the localized distribution of eumelanin (black pigment) on the muzzle of the dog which resembles a dark "mask" on dogs with lighter colored coats. Although the Em variant produces a black melanistic mask, the final color of a dog's mask is dependent on other DNA variants such as the B and D loci that modify the production or appearance of the eumelanin (black pigment) in the dog. For example, dogs that are b/b at the B locus will have brown masks due to the disruption of eumelanin synthesis that results in the conversion of black pigmented areas to brown. 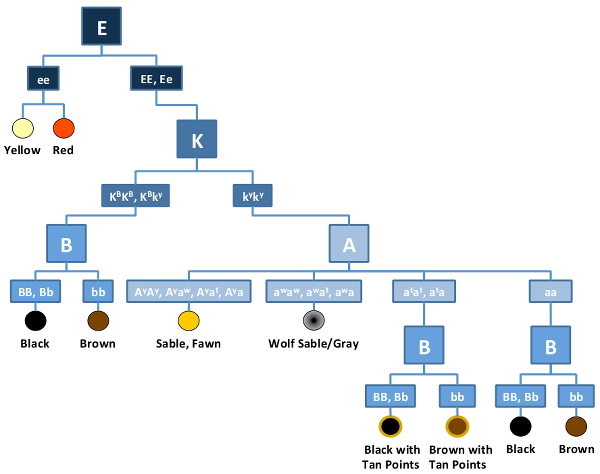 Genetic testing of the MC1R gene for Em will determine whether a dog is a genetic Carrier of two, one, or no copies of the melanistic mask variant. The melanistic mask seen in some breeds of dog is inherited in an Autosomal Dominant manner meaning that dogs only need to inherit one copy of Em to have the characteristic mask. Dogs with an Em/Em genotype will have a melanistic mask and will only produce puppies with masks. Dogs with an Em/N genotype will produce puppies with masks at least 50% of the time depending on the genotype of the partner dog. Dogs without masks do not carry the Em variant and can be bred to other N/N dogs to produce dogs without masks.